Click here to have our quarterly newsletter delivered to your inbox! October is Pregnancy and Infant Loss Awareness Month. While the stigma surrounding miscarriage and infant loss is slowly lowering, hundreds of women and men grieve silently after losing their baby for fear that those around them won’t understand their sadness. Pregnancy and Infant Loss affects all socioeconomic classes, races and ethnicities. One in four women will experience a miscarriage. Each year, 24,000 women will experienced a stillbirth. and 23,000 babies died in 2016 before their first birthday according to the Centers for Disease Control. If you, or someone you know is grieving the loss of a pregnancy or infant, please click here for information on our Pregnancy and Infant Loss Support Group. This group is free of charge and held each Monday evening. 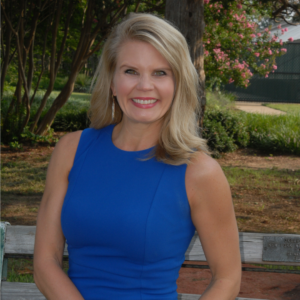 Following on the heels of strong leadership before me, I am thrilled to join the Calm Waters family as the new Executive Director. I am a mother of seven children, four of whom I never had the chance to hold, which is why the mission of Calm Waters is so powerful to me. I’ve experienced grief in my life, just as everyone will at some point in their lives. I withdrew from those closest to me in an attempt to grapple with my losses. I felt alone and desperate. Had I known about Calm Waters and their free support groups, I know I would have healed, emotionally, more quickly and been able to grieve the loss of my babies. That’s what Calm Waters does – we wrap children and parents with support, helping them realize they are not alone in their grief journey and providing programs and services unique to grief because of a death, divorce or other significant loss. receive the help they desperately need. incarceration, deployment, deportation, foster care or adoption. All of them received this help for FREE. Please help us continue to provide a place of healing, hope and support to children and families in your community. What an amazing experience! 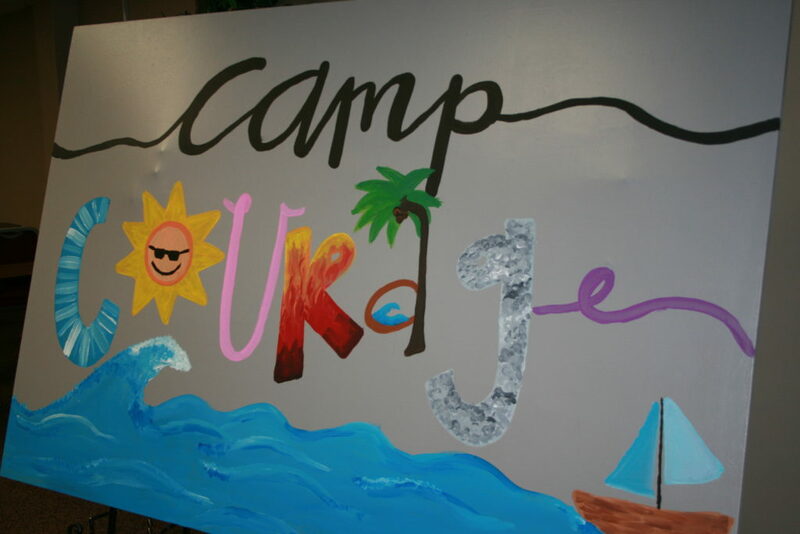 Thank you to all of our donors and supporters who made Camp Courage possible. We had TWELVE artist donate their time, materials and resources for three whole days! We are grateful to each of you and hope you enjoy watching our Camp Courage video as much as we have! Click below to meet our campers! Click here to watch the amazing video one of our artists put together! 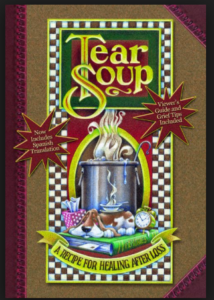 On week one of grief group, we read Tear Soup with our participants. 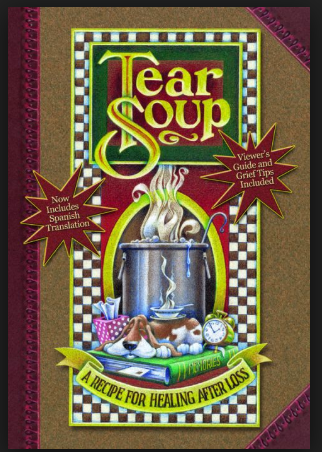 Tear Soup, a short video and book, walks you through the early stages of grief and what that looks like for a grandmother who has recently lost a grandchild. Quick, isn’t always better when it comes to the grief process. Grief is never clean, people feel misunderstood, feelings get hurt and wrong assumptions are made. Grief always takes longer to “cook” than anyone actually wants it to. For a period of time, you may not have the energy to enjoy the things you once enjoyed and you may not care about them anymore either but your joy will return. There are some parts of grief you will need help from friends and there are some parts you must do alone. You will never truly “finish” the grieving process. You will work through a phase and from time to time you will revisit it. Grief, like soup, changes the longer it simmers and the more you put into it. There is something deep within everyone that aides you in surviving the things we don’t feel we can survive. If you, or someone you know is currently on their grief journey, please forward or share this newsletter with them. We would love to help them in any way we can.